I have been a fan of theBalm Cosmetics ever since trying their Mary-Lou Manizer highlighter, which is now a staple item in my everyday makeup routine. I utterly adore their branding and the pin-up girl illustrations that they use on their packaging; I've said this time and time again on my blog, but I am such a sucker for packaging when it comes to buying new makeup. I think this slightly stems back to studying Graphic Design at college, but I will pay a little extra if I like the packaging an item comes in. 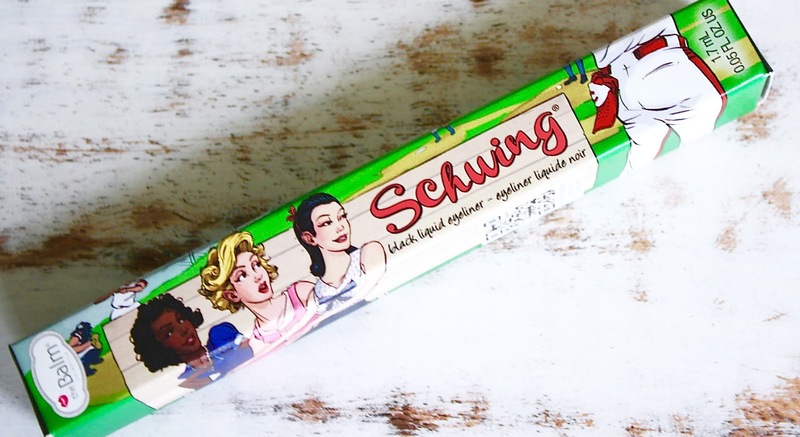 I was browsing ASOS recently and decided to take a look at their eyeliner selection, when I found theBalm Cosmetics 'Schwing' eyeliner and before I had a moment to think about the purchase, it had found its way into my basket and had been checked out. Aside from the super cute packaging, the price tag drew me in when I saw that it was only £12.00; I tend to usually pick up eyeliners that are less than £10.00 but for a brand that I love, I couldn't complain at £12.00. Over the past year, I have developed more confidence when it comes to applying liquid eyeliner, something that I used to stay very far away from. I had started out by using the Soap & Glory Supercat eyeliner as I used to find that eyeliner in a pen-form was easier to apply. Over time, I have switched up my routine and I now find it easier to apply eyeliner when it comes with a brush applicator. 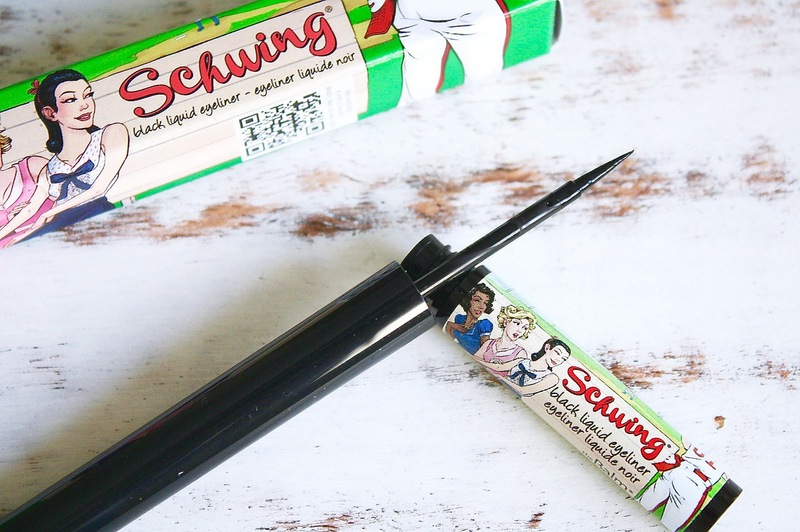 The Schwing eyeliner is just perfect for me as it has a brush applicator and it is incredibly lightweight to hold, too. The brush isn't too flimsy and I find that it has just the right amount of sturdiness to get a really neat line on first application. The colour of the product is jet black too, which is just what I was after. I find that there is nothing worse with an eyeliner than when it comes out grey on application or when it rubs itself out, the more you try to work back in with the product. I always gently draw out the first line/cat flick and work back in to build up the line, and this only took me 2-3 attempts with the Schwing eyeliner. I also found that it lasted all day without smudging (my eyes run a lot when I laugh throughout the day..) and it didn't crumble away beneath my lashes either. 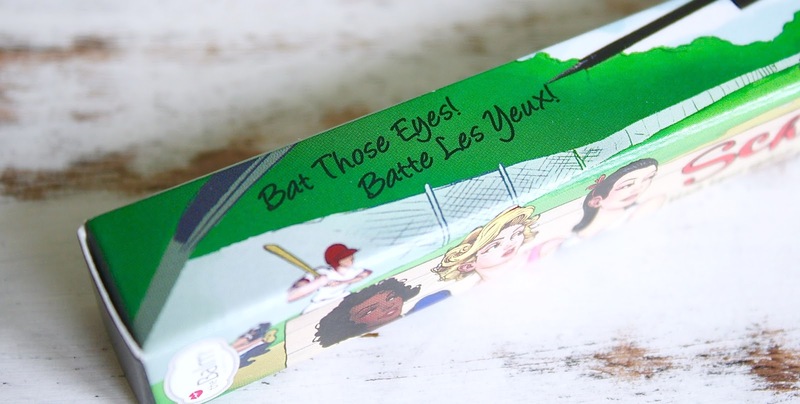 I do think it's safe to say that it's going to take quite a lot to knock the Schwing eyeliner off it's podium and to be replaced in my everyday routine now. If you have tried this product, I would love to hear your thoughts. I would also love recommendations for which product from theBalm Cosmetics range that I should pick up next.